California's varied landscape is characterized by a spectacular abundance of plant life, including a magnificent variety of trees and shrubs. This is the first book to combine the trees and shrubs of California in one accessible field guide. 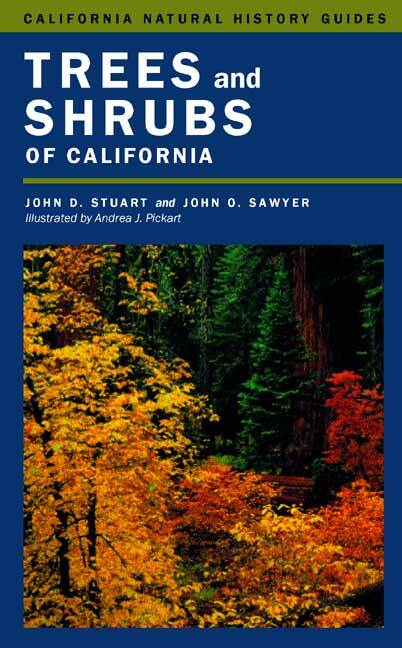 Trees and Shrubs of California identifies and describes native California tree species and most common shrub species. The text is complemented by more than 200 beautiful line drawings, 300 range maps, and 40 color photographs. In their introduction, the authors discuss the dominant vegetation types, climates, principal landforms, and elevations of California's ecological regions. They explain the classification system and nomenclature used in the book, which includes both scientific and common plant names and is based on the 1993 edition of The Jepson Manual. The authors also provide a step-by-step explanation of how to use the dichotomous keys to identify plants and distinguish between trees and shrubs. This user-friendly field guide minimizes technical terms and includes a checklist, making it an invaluable resource on California's profuse vegetation. John D. Stuart is Professor of Forestry at Humboldt State University. John O. Sawyer is Professor of Botany at Humboldt State University and coauthor, with T. Keeler-Wolf, of A Manual of California Vegetation (1995), among other books. Andrea J. Pickart is an ecologist with the U.S. Fish and Wildlife Service.